If you’re following your main wedding celebration with a party by your private villa’s pool, then chic brides and fashionable bridesmaids will want to slip into something fabulous before the festivities begin. If you’re getting married in one of Thailand’s luxury private villas, then it’s highly likely that your property will come with spectacular sea views and possibly even an infinity pool. Many brides and grooms that travel thousands of miles to host their wedding in the Land of Smiles often organise multiple days of celebrations, both for themselves and for guests that have made the long journey to join them in celebration. A pool party is one of the most popular ways to extend the festivities, but because it’s technically still part of the wedding celebrations the bride and her bridesmaids still need to look their best. Below are a few poolside outfit ideas to add a little poolside glamour. For a cool and casual look, the Ravello woven tunic dress by Heidi Klein is a pool party classic. This is a label renowned for its distinctive prints and classic cuts, and this tunic dress is no exception. Named after the Italian resort town of Ravello, it conjures up exotic images of the Mediterranean coast – making it an equally perfect pick for a glam pool party in Thailand. White fabric with a cool blue print gives an air of serenity, and the smock detail adds extra embellishment. For newlywed ladies that want to continue the bridal wardrobe theme for as long as possible, the off-the-shoulder georgette dress by Melissa Odabash is perfect. This luxury lifestyle brand bridges the gap when it comes to elegant lounging wear. Short cape sleeves and all-over lace give the frock an extra feminine appeal, and the crisp white hue makes it a cool and comfortable choice for a pool party. Pair with a broad-rimmed sun hat, super-size sunglasses and wedge heels for the ultimate lux beach look. 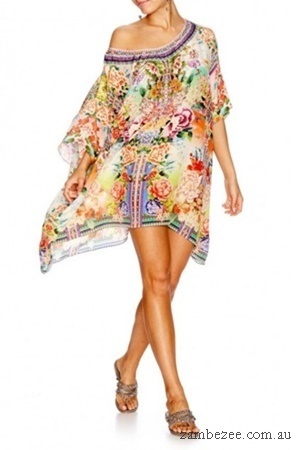 If you’ve had enough of white dresses and want to slip into something a little more colourful for your post-wedding pool party, the silk georgette kaftan by Camilla ticks all the boxes. Australian designer Camilla Frank’s fashion label is synonymous with beachwear luxury, and this silk kaftan features a kaleidoscope of colour to make every bride shine the day after her wedding. The lightweight, airy material is ideal for a balmy afternoon by the pool, and the hand-applied crystal embellishment adds extra pizazz. If you’re hosting a pool party they you will need to have a bathing suit lined up just in case you actually do any swimming between the Bellinis and barbecue-roasted appetisers. If all your family are going to be in attendance, it’s fair enough to don a more conservative one-piece suit rather than the skimpy bikini you packed for your honeymoon. One-piece bathing suits are all the rage this season and Stella McCartney’s lace-up suit balances poolside chic with a wonderfully laid back look. With a low scoop at the back, this style is sure to create a sleek poolside silhouette. If you’re hosting or attending a pool party the day after the main wedding celebration, you might still be suffering from a bit of a sore head after one too many glasses of bubbly the day before. If this is the case, you’ll need a pair of stylish sunglasses to hide away tired eyes whenever a camera is in the vicinity. 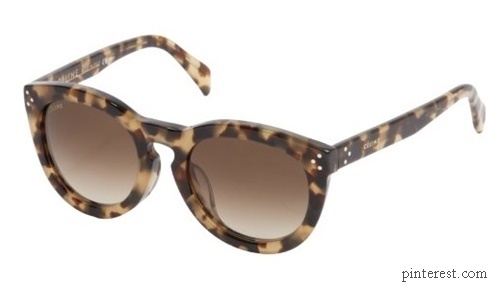 The round tortoise-shell frame glasses from Parisian design label Celine ooze retro-inspired glam. Put these glasses on and you’ll be well on your way to feeling like a million dollars again.